Do you experience challenges with the process of window washing around your property? Your struggles are not enough to remove stains, water streaks and dirt from glass surfaces? 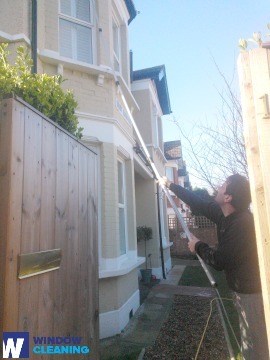 The specialists of window washing in Newington Green will render you assistance! Say bye-bye to the endless hours of polishing and wiping – the skilled and experienced team members will handle this problem. You will be able to enjoy your free time – just let us do this monotonous and exhausting chore for you. Our professional approach will grant you lots of perks. We also provide our professional services in nearby areas: Canonbury, Pentonville, Essex Road, Balls Pond Road, Kingsland. We will make sure that the windows of your office will be nice and sparkling, like brand-new. Accomplish that by just booking our commercial window cleaning. For windows as high as the fourth floor, we utilise water fed extension pole equipment which is totally safe and efficient. London is famous for it's tall buildings. So when it comes to those highly-placed windows we will bring into action our rope access team. With this advanced technique, we can give you finish surpassing any other! We use the most exceptional methods to make sure that you take advantage of highest quality window cleaning. With our water-fed extension pole system and high pressure cleaning methods, you will enjoy crystal clear look of your windows. We connect our poles to water supply in our vehicles to make sure that there is no danger for the exterior of your home or business premise. For higher windows, we employ entirely secured rope access approach. You can profit from these cleaning methods now – just ring 020 3746 3113! You can always depend on our workmanship and devotion for domestic and commercial window cleaning. Our competence allows us to clean all kinds of windows you could have at your property. For example, you can book cleaning of small or double windows, French doors, sash windows, patio doors and bay windows. Besides that, we include conservatories and roof windows as part of our routine. So to speak, you can fully enjoy the good look of your windows with our prompt and trustworthy services. You will see your luminous home after the best window cleaners in Newington Green visit you. We provide great services for the entire London district. The leading methods are included in our working practice – including water-fed extension pole system and and jet washing. You will see for sure the change domestic hygiene – we use purified water for the process of inside/outside window washing. Call us today on 020 3746 3113. Our customer service representatives will help you and answer any inquiries. Furthermore, you can use our online booking from.